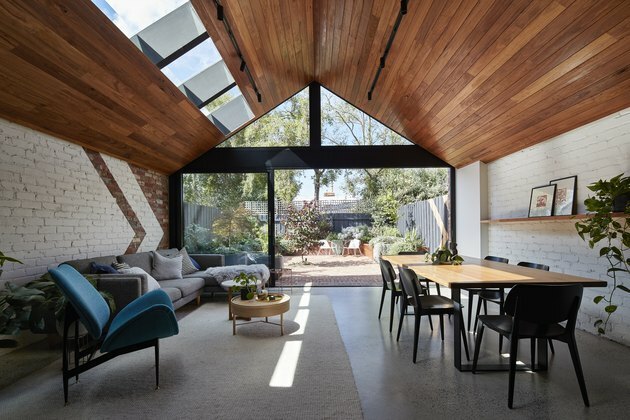 When renovating a small cottage in Abbotsford, a suburb of Melbourne, Australia, architect Anna Rozen was placed in an unfamiliar role: client. She had moved into the home with a number of objectives, including maintaining its history while creating a polished space, but she also wanted to build a happy sanctuary for her two young children. Rozen began by connecting the main living space and the rear garden with an expansive wall of windows. Then she moved on to outlining the open living room, kitchen, and dining area, and made sure to include hardy materials like concrete that'll stand up to hours of playtime. 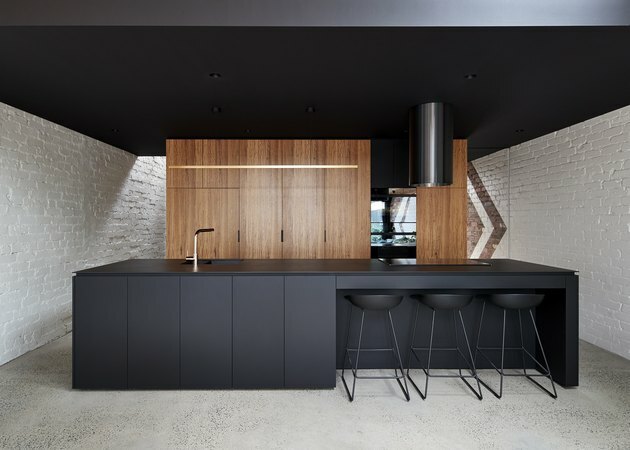 And since she wanted a minimalist aesthetic, the kitchen's appliances and storage were integrated into a timber-wrapped box to hide any clutter. 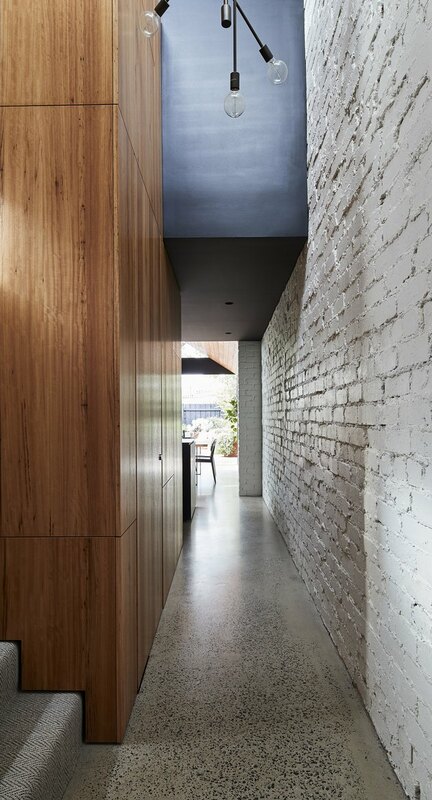 To retain property's historic character, the architect used original and recycled brick as primary features. But she added materials such as timber, raw concrete, and black anodized aluminum to really pay tribute to the neighborhood's past. "The materials are a reference to the area's industrial legacy and contrast with the 'shininess' of the surrounding gentrification," Rozen said. Now that her design goals are met and her family's needs are answered, Rozen can enjoy her work from a new title: homeowner. Black anodized aluminum cladding frames the window wall that separates the main living space from the back garden. The garden's paving was done with recycled red brick and the chevron pattern on the fence echoes the motif on the living room wall. Rozen designed the living and dining area to be a space where the kids could play and adults could relax. The ceiling is lined in warm recycled cedar timbers and punctuated with a row of skylights. The dining table from Neel Dey Furniture has a recycled top and the dining chairs are from Café Culture + Insitu. 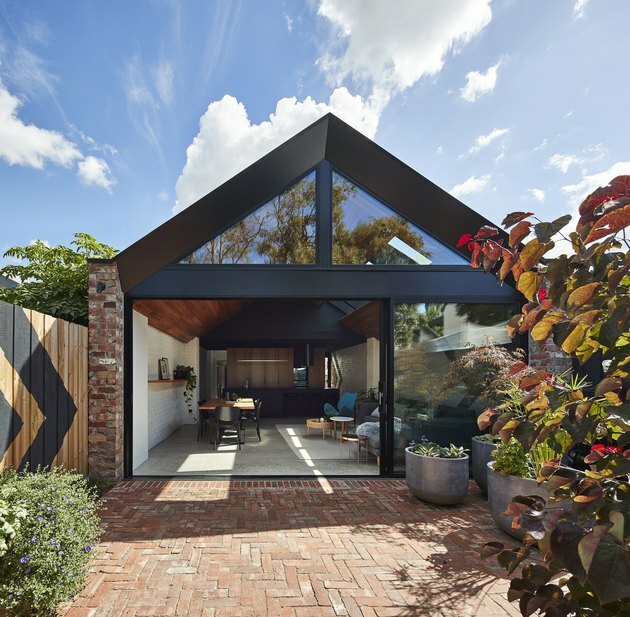 "Painted chevrons playfully reference the pitched-roof forms whilst also heralding the old red-brick wall," Rozen said. 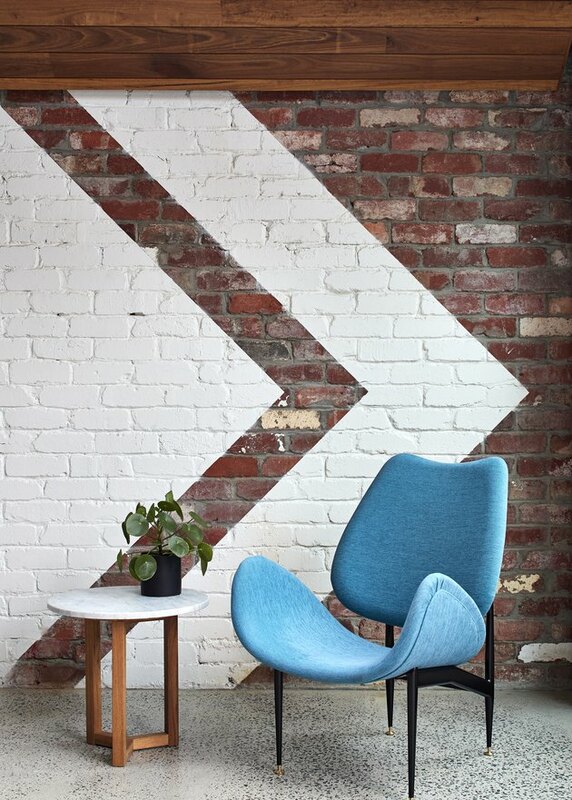 The Grant Featherston armchair is one of Rozen's favorite pieces. The timber box conceals the kitchen's appliances and storage, making it easy to tuck everything out of sight. Hay stools are pulled up to the black island, which is illuminated with a pendant light by Archier, an architecture firm in Melbourne. The narrow hallway's brick wall was brightened with a coat of white paint. 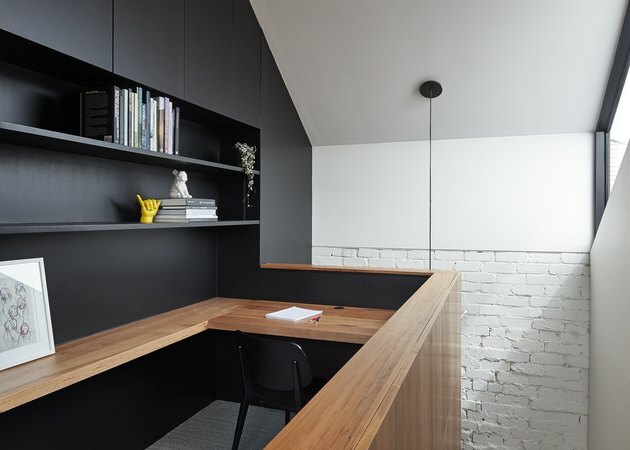 The stair landing was transformed into a study with an L-shaped workstation made of recycled timber and built-in shelving. 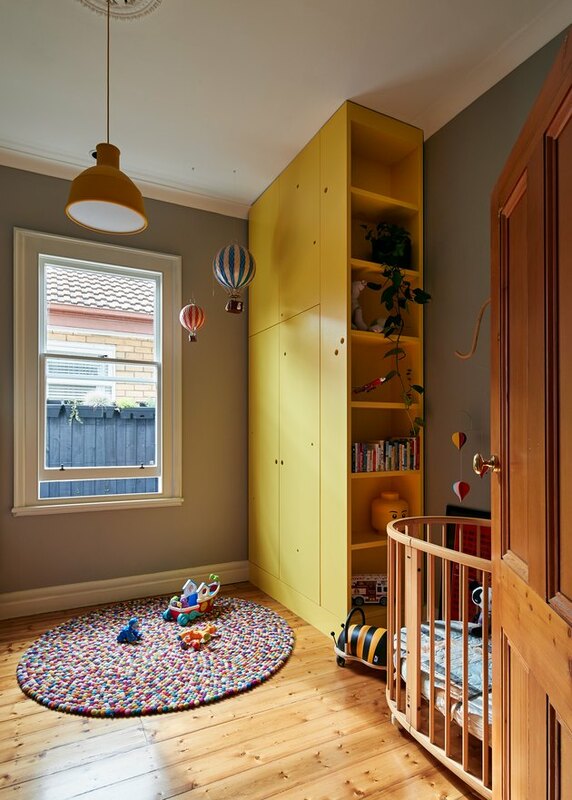 Rozen kept the existing Baltic pine floor in the kids' room and added a tall cupboard painted in Dulux's "Dandelion." A cheery pendant light by Muuto hangs overhead. Ceramic tiles line the walls and floor of the bathroom. 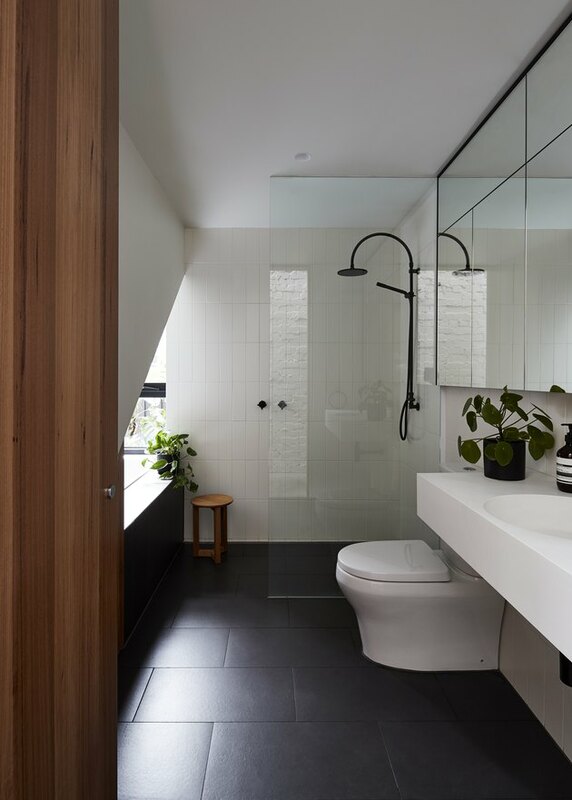 Rozen chose black fixtures by Brodware and a minimalist vanity by Omvivo.